"This victory... let us dedicate it to him." I am Marchosias, a Knight. I still wish to serve my previous master. I hope to be equal comrades with you. A knight's Oath, a truly dignified battle of fate! I am sincerely honored to wield this power once more. Come forth, Seven Lives' Report to God, Seventh Throne! This victory... let us dedicate it to him. Defeat, I regret it... Run away, Boy...! In the back alleys of the downtowrn Shinjuku area, greed and treachery run amuck. There, amid the trash and waste of the sleepless city, screams and coquetry intertwine. Just as this demonic knight was summoned from a placed called Hell, he witnessed a man receive a fatal blow while trying to protect a young child. It was obvious his life would soon be extinguished and so the man made a pact with the demon, but instead of wishing for his life to be saved, he bartered for the child be protected. It happened late one night in a dark alley in downtown Shinjuku. Marchosias was summoned from his world only to find himself before a terrified child, and a lethally wounded man. 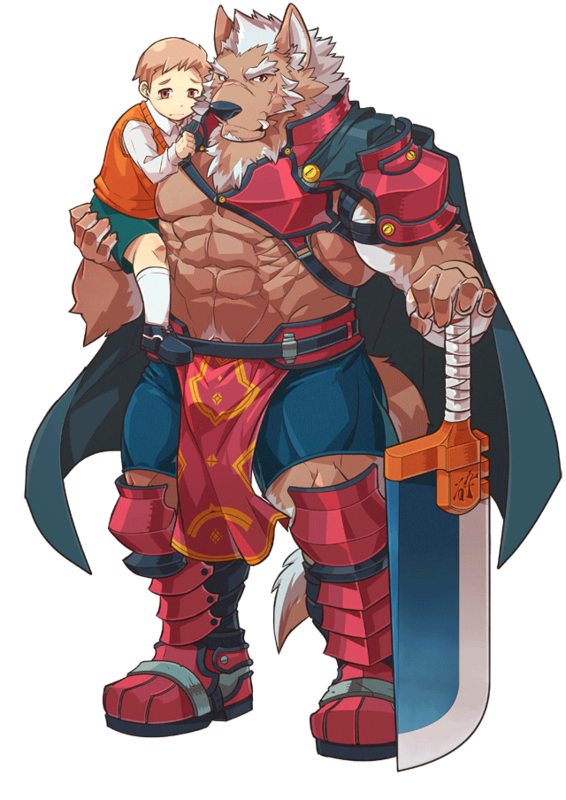 Weakly, the man made a last plea to the summoned demon knight, to take care of his orphan son. Marchosias looked into the eyes of the man who called out to him, seeing a light he never saw in his home. With his deal with a devil complete, the man smiled in relief and closed his eyes for the last time. Greatly respecting people who are sincere, this Hell Knight is more virtuous than the angels. He lives by a code that requires he respond to sincere wishes with sincerity in turn and thus dives headfirst into battle against those targeting a young boy under his protection, never asking for an explanation, much less reward. He remains oblivious to the true nature of that which the boy inherited from his late father; an item that contains the truth of the Gates and the App soon to bring calamity down on Tokyo. Though he is technically a stray summon, Marchosias fulfills the wish of his late summoner nonetheless. Whether there is something special about the boy, or if he is merely a son suffering the sins of his father, Marchosias does not know, but there are many out there who seek to hurt him. But the reason doesn't really matter: he stakes his honor as a knight on his vow to faithfully carry out sincere wishes, and so continues to protect his charge from all comers. What he remains unaware of is the child's knowledge regarding the truth of the incident that opened the world gates, inherited from his late father, and neither yet knows how tremendously this knowledge will affect Tokyo in the future. 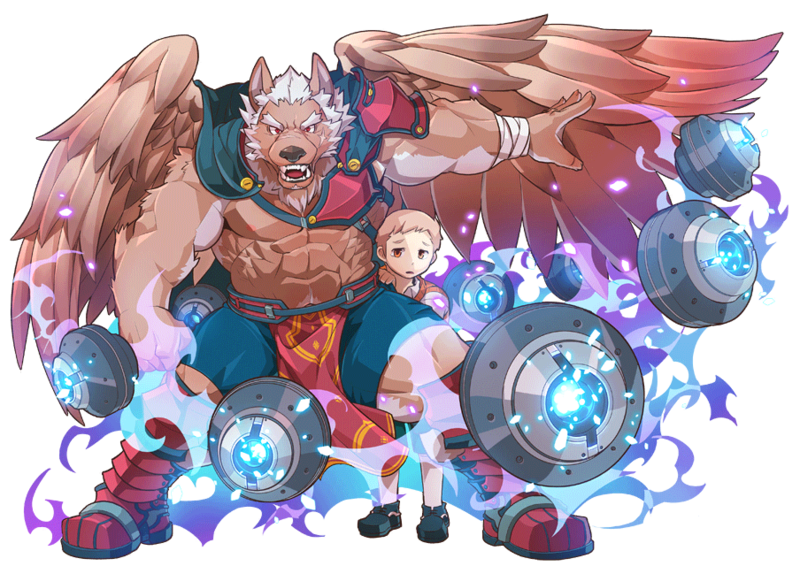 Marchosias is another character with basis in the Ars Goetia, depicted as a wolf with gryphon's wings and a serpent tail. Unlike many of his fellow Goetic demons, Marchosias was faithful to his summoners, and cursed his fate as a fallen angel. Though he hoped to one day return to Heaven, that hope would never be rewarded. So what are those orbs flying around him in his 4* art? So we still don't know the child's name, right? He looks so strong and handsome, but I think he really need to buff in game!